This Network DVD release will please fans of the errant secret agents fight against faceless authority as the show has been given a restoration job that makes the previous Carlton discs look tired and grubby. Colours are vibrant, frames are free from dust and scratches, and the 5.1 soundtrack has been sympathetically created from the original triple track audio. The Prisoner has never looked or sounded better. Topping of the set are some extras that will help explain the show thanks to a range of interview with people associated with the production. The key Making of documentary is fascinating and helps to debunk much of the deep and meaningful mythology that surrounds the show. Clearly, many of the people working on The Prisoner - including writers - were fumbling in the dark, hounded by a producer, who was also the star of the show, as he quickly lost the plot... quite literally. Patrick McGoohan, whose idea The Prisoner was, clearly felt under pressure to succeed but seemed unable to communicate his vision. 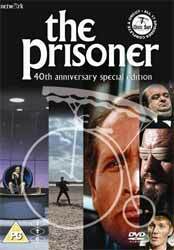 The Prisoner is part allegory [the individual vs faceless authority], part spy thriller, and part patchwork of '60s iconography. It is also a deeply flawed show which failed to maintain much in the way of internal logic. This was partly the result of a fractured production run that saw the episode count expand and contract, and finally collapse at 17 shows. And it was obviously initially seen as a seven episode run as episode six in production was Once Upon a Time, which was finally screened as episode 16. Just what McGoohan had planned for episode seven isnt known, but it almost certainly wasnt made up the shows final instalment, Fall Out - 50 minutes of meaningful but ultimately confusing court room scenes that owe more to Dali or Francis Bacon paintings than familiar TV structures. The biggest problem with these DVDs is McGoohan presence - both behind and in front of the screen. Behind the scenes he clearly was unable to control or communicate his direction. This, of course, helped give the show its unique flavour but a more coherent narrative would have helped flush out some of the screamingly self-indulgent and over the top elements including the whole of The Girl Who Was Death. However, McGoohans on screen presence is where things really fall apart. Hes generally regarded as a good actor who turns in a great performance in The Prisoner - perhaps his best. Sadly, his emotional range stretches from silent angst to subdued rage... and then back again. He exhibits no warmth, humour or real humanity, which makes his nameless hero very hard to like.